I was walking in the woods and came across this big old eight point buck lying down resting in the woods. My heart stood still and I quietly began to take his photograph, but I didn't like the way he was positioned. I walked quietly all around him from far off, but the pictures didn't get any better. The deer was totally unfazed by my presence. So I figured I needed to get him up on all fours to get a better picture, but I didn't want to scare him away. 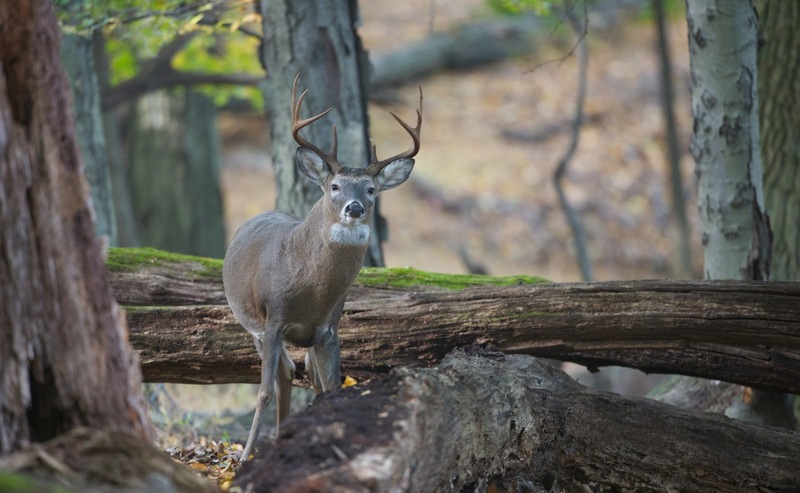 I jumped up and down, lifted a big branch in the air, made a growling sound, but the old buck wouldn't budge. Finally I set the camera up on the tripod and stabilized it. Then I walked right up to the buck who finally got up. I then ran back to the camera and clicked the shutter. You can see the buck is wondering what the heck I am doing. He stuck around for a little while (see www.kittykono.com for another view) but finally ambled off to find a girl friend.